Sometime around July, when we start getting into the real dog days of summer, I lose my desire to cook (or eat) hot food. It’s like my internal thermometer suddenly hits “gazpacho and salad season” and there’s no turning back until the fall. 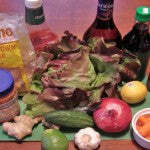 These Thai inspired lettuce wraps are a quick and easy dish to prepare, perfect light fare for picnics or barbecues. 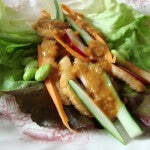 The sauce is an adaptation of my mother-in-law’s fantastic peanut sate sauce that she learned from a Thai cook in Tokyo. The recipe makes more than enough for the wraps and dipping and once you try it you’ll be glad you have extra to keep in the fridge for dipping. 1. 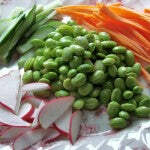 Spread carrots, cucumber and radishes at the bottom of a medium size casserole dish or pan. Pour rice wine vinegar over the vegetables. Toss vegetables to coat and spread them out and set aside to pickle for at least an hour. 2. 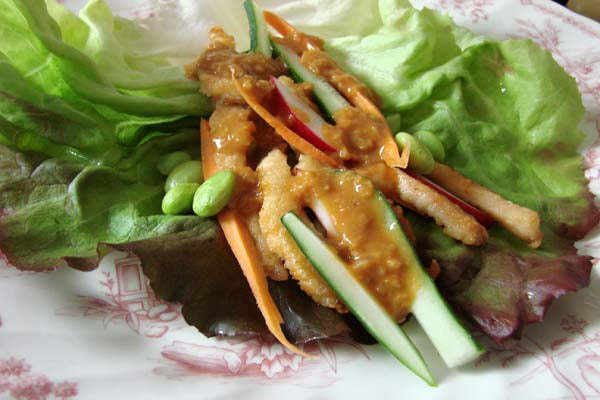 In a medium skillet heat three tablespoons vegetable with sesame oil. Add red onion and sauté until translucent, about 5 minutes. Add garlic and ginger to onions and stir to incorporate then stir in red wine vinegar and brown sugar. Cook until caramelized then remove from heat. Stir in The Heat Is On Peanut Butter, soy sauce, ground coriander, and ketchup. Add hot water and stir in quickly to thin the sauce. 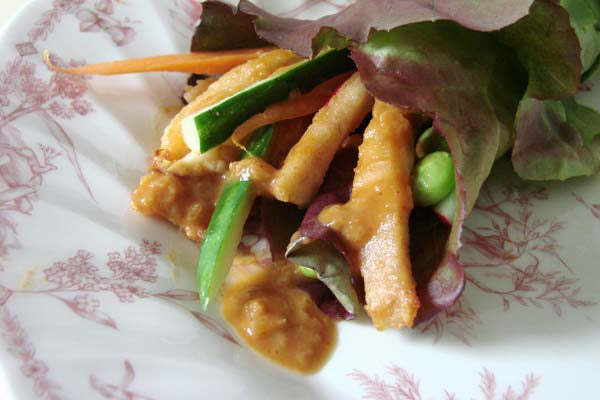 Add lemon and lime juice to taste and Sriracha sauce, if you like your peanut sauce spicy. Pour sauce into a medium bowl and refrigerate until ready to use. 3. In a medium bowl mix all purpose flour with salt. Cut chicken into thin strips and dredge with flour. In a large skillet heat 1 tablespoon vegetable oil and coat pan. Add floured chicken and cook in batches until chicken is browned and cooked through. Remove chicken from heat and cool on a large plate. 4. 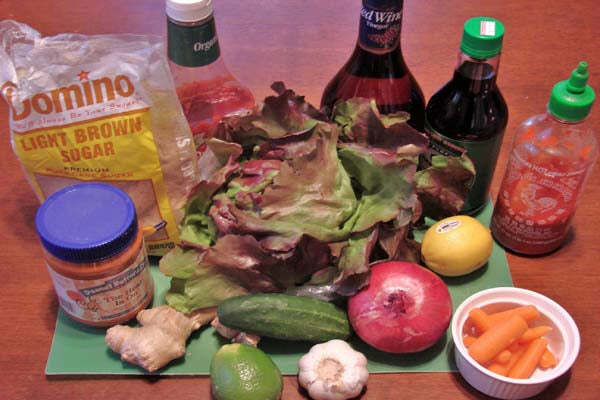 Wash lettuce leaves and carefully pat dry with a clean dishtowel or paper towels—since you’re making lettuce wraps you’ll want to make sure that your lettuce leaves remain intact. 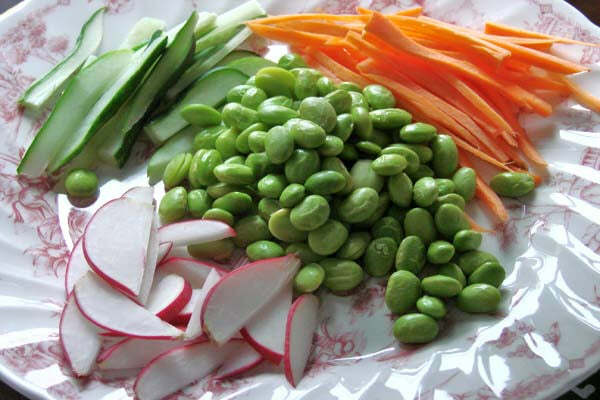 Divide chicken into 8 portions and layer on top of the lettuce leaves, then layer each leaf with pickled vegetables and sprinkle edamame on top. 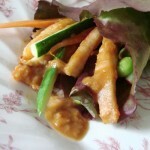 Top with peanut sauce and roll wraps. Assemble wraps just prior to eating and serve with additional sauce on the side for dipping. Cover and refrigerate any leftovers. The post Spicy Thai Peanut Lettuce Wraps appeared first on - Peanut Butter & Co. Recipe Blog.